Brain tumors are the leading cause of cancer-related death in children. High-grade astrocytomas (HGAs), in particular, are lethal in children across all ages. Integrative genome-wide analyses of the tumor's genome, transcriptome and epigenome, using next-generation sequencing technologies and genome-wide DNA methylation arrays, have provided valuable breakthroughs in our understanding of the pathogenesis of HGAs across all ages. Recent profiling studies have provided insight into the epigenetic nature of gliomas in young adults and HGAs in children, particularly with the identification of recurrent gain-of-function driver mutations in the isocitrate dehydrogenase 1 and 2 genes (IDH1/2) and the epigenetic influence of their oncometabolite 2-hydroxyglutarate, as well as mutations in the histone 3 variant 3 gene (H3F3A) and loss-of-function mutations in the histone 3 lysine 36 trimethyltransferase gene (SETD2). Mutations in H3F3A result in amino acid substitutions at residues thought to directly (K27M) or indirectly (G34R/V) affect histone post-translational modifications, suggesting they have the capacity to affect the epigenome in a profound manner. Here, we review recent genomic studies, and discuss evidence supporting the molecular characterization of pediatric HGAs to complement traditional approaches, such as histology of resected tumors. We also describe newly identified molecular mechanisms and discuss putative therapeutic approaches for HGAs specific to pediatrics, highlighting the necessity for the evolution of HGA disease management approaches. Today, primary brain tumors constitute the leading cause of cancer-related mortality in children and adolescents aged 20 years and under, now surpassing leukemia, and the third leading cause of cancer-related death in young adults aged 20 to 39 years . These brain tumors have a devastating socio-economic impact on patients and their families, with significant disease and treatment effects and healthcare costs, and with many if not most patients with higher-grade tumors dying after enduring the 1 to 3 year course of their cancer and the side effects of their therapies. Gliomas are the most common primary central nervous system tumors in both children and adults . This heterogeneous group of tumors is classified by the World Health Organization (WHO)  into four major groups: astrocytomas; oligodendrogliomas; mixed oligoastrocytomas; and ependymal tumors. They are then further segregated into distinct histological grades, ranging from WHO grade I to grade IV on the basis of defined cytologic and histologic features, including cellularity, mitotic activity, nuclear atypia, microvascular proliferation and necrosis (Table 1) . The most important prognostic factors across the age spectrum are tumor grade, age at diagnosis, and completeness of surgical resection [2, 4]; however, glioblastoma multiforme (GBM, grade IV astrocytoma) remains essentially incurable despite decades of concerted therapeutic efforts. Pilocytic cell morphology, less infiltrative, low proliferative activity. Cerebellum, optic pathway, brainstem, thalamus and spine. Surgical resection, adjuvant therapies considered in the case of incomplete surgical resection. Infiltrative with low proliferative potential but often recurs. Can progress to higher grades in adults. Cerebrum, optic pathway, brainstem, hypothalamus, thalamus and spine. Surgery; adjuvant therapies considered on a case by case basis. Infiltrative, with nuclear atypia and higher mitotic activity. Surgical resection when possible, followed by adjuvant radiation and chemotherapy. Infiltrative,nuclear atypia, high mitotic activity, pseudopalissading necroses, florid microvascular proliferation. Cerebrum, cerebellum and spine, but brainstem gliobastoma multiforme (DIPGs) are more frequent in children. DIPG, diffuse intrinsic pontine glioma. The tumor location, pathological subtype and tumor grade, as well as the potential for a stepwise progression from lower to higher grade, have been shown to vary with age (Figure 1). For example, oligodendrogliomas and high-grade gliomas (HGGs) are less common in children . By contrast, grade I astrocytomas - termed pilocytic astrocytomas (PAs) - are the most common primary brain tumor in childhood, accounting for approximately 25% of all pediatric brain tumors [2, 3]. They arise most frequently in the cerebellum, followed by the optic pathways, where they occur as sporadic tumors or in the context of neurofibromatosis type I, followed by the brainstem, thalamus and the spinal cord. Conversely, PAs rarely arise in the cerebral hemispheres or in patients older than 18 years [2, 5]. Overview detailing the differences between astrocytomas in the pediatric and adult age groups. (a) Depiction of grade distribution in adults and children highlighting that the majority of astrocytomas in adults are grade IV astrocytomas (glioblastomas), whereas the majority in the pediatric years are grade I astrocytomas (pilocytic astrocytomas). (b) Depiction of tumor localization. 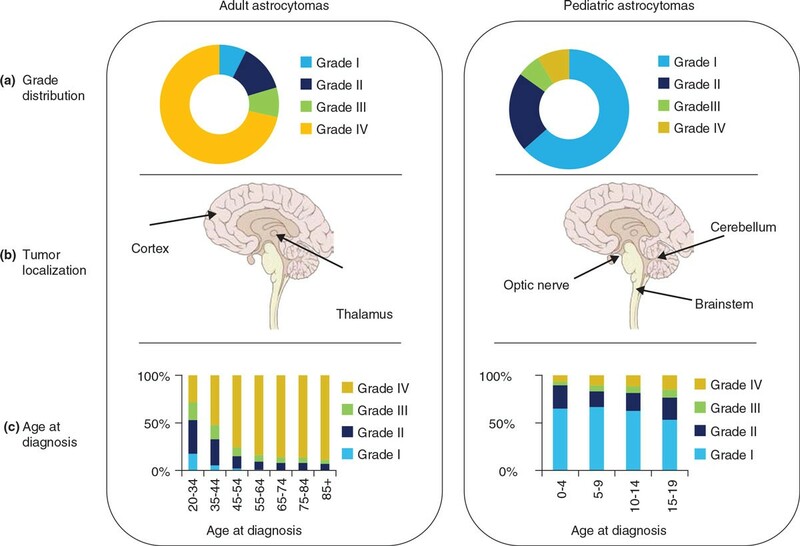 In adults, astrocytomas are most likely to arise in the cortex and the thalamus whereas in the pediatric years, astrocytomas are most common in the cerebellum, optic nerve and brainstem. (c) Age distribution between the four astrocytoma grades in adults and children. Grade and age data summarized from . WHO grade II (diffuse) astrocytomas are more common in younger adults and usually progress to higher-grade tumors, that is, to anaplastic astrocytoma and secondary GBM in adults, whereas stepwise progression is rarely reported in children . The majority of GBM tumors, however, are primary tumors that arise de novo and typically manifest in older patients (older than 60 years), where they account for the most common type of primary central nervous system tumor in that age group. In adults, gliomas occur mostly as supratentorial tumors, mainly in the cerebral cortex and the thalamus [1–3, 5, 7] (Figure 1). HGAs in children represent less than 15% of all primary central nervous system neoplasms and encompass tumors mainly located in supratentorial regions including the cortex and the thalamus, similar to adult high-grade tumors, but also in the brainstem, a tumor location that is almost exclusive to children, where they are named diffuse intrinsic pontine gliomas (DIPGs) . The vast majority of pediatric GBM tumors will arise de novo, without evidence of a pre-existing lower-grade lesion and subsequent tumor progression to secondary GBM, in contrast to young adults with this disease. The neuroanatomical specificity of particular tumor subtypes within adult and pediatric age groups suggests that important, intrinsically unique biological factors, such as developmental constraints, cellular origin and tumor microenvironment, may contribute to specific forms of gliomagenesis in distinct brain regions [9–11]. Importantly, this is exemplified in PA, which has been described as essentially a 'single-pathway' disease with defects primarily affecting the mitogen-activated protein kinase (MAPK) pathway, most commonly with defects in BRAF [12–18], a serine-threonine kinase member of the RAF kinase family that regulates MAPK signaling. Duplication of BRAF at chromosomal region 7q34 was shown to define the majority of PAs , and was further characterized in association with the formation of a variety of in-frame fusions between KIAA1549 and BRAF . These fusions invariably lead to the loss of the N-terminal regulatory domain and/or constitutive activation of the RAF kinases, resulting in increased MAPK pathway signaling. The mechanism leading to 7q34 duplication and BRAF fusions, a defining feature of PAs, is unclear. Recent studies suggest that the process of microhomology-mediated break-induced replication may be involved in the generation of these structural rearrangements . Interestingly, although KIAA1549-BRAF fusion was shown to characterize the vast majority of PA tumors, notably of the cerebellum and optic pathways , other mutations/alterations - or 'hits' - leading to activation of the MAPK pathway have been described, such as the BRAF V600E mutation, NF1 mutation or loss (in neurofibromatosis-type-1-associated PA), and other RAF-family fusions, usually observed in non-cerebellar PA tumors [14–17]. Recently, Zhang et al. and Jones et al. described MAPK pathway hits in 95 to 100% of PAs, demonstrating the central importance of targeting specific pathway alterations in this tumor type [20, 21]. This is of importance because BRAF and the MAPK pathway have been shown to have a key role in cerebellar development, with neural stem cells (NSCs) in this region demonstrating proliferation in response to expression of KIAA1549-BRAF, whereas NSCs in regions of the neocortex, for instance, do not (reviewed in [18, 22]), paralleling incidence rates of KIAA1549-BRAF fusions detected in human tumors. These findings are being translated into clinical practice, as phase I/II clinical trials are currently assessing the benefit of using MAPK inhibitors in cases where adjuvant therapies are required . In the context of low-grade diffuse astrocytoma, recent studies by Ramkissoon et al. have uncovered a chromosomal gain at 8q.13.1 in 28% of diffuse astrocytoma patients (grade II) that leads to a partial duplication of MYBL1 with a simultaneous truncation of its C-terminal negative regulatory domain . This lends insight into other molecular events that predominate in low-grade gliomas. Prognosis of HGGs has remained dismal despite decades of concerted therapeutic efforts. Current therapy across age comprises resection if possible, followed by radiotherapy. Adjuvant therapies include the alkylating agent temozolomide [25, 26] and targeted therapeutic inhibitors, such as EGFR against receptor tyrosine kinases (RTKs)  and bevacizumab against the angiogenic factor VEGF-A [28, 29]. All demonstrate minimal impact on survival (Table 1) [2–4]. Here, we present an in-depth discussion of recent studies utilizing high-throughput genome-wide methods such as next-generation sequencing, and integrating data with gene expression profiling, DNA methylation and copy number analysis in HGGs, with a focus on GBM across the age spectrum. These studies shed light on novel molecular mechanisms and provide arguments for a paradigm shift in GBM treatment that will hopefully translate into individualized patient management and ultimately better therapeutic success for this deadly group of diseases. Genome-wide technologies including sequencing, copy number analysis and gene expression profiling have revolutionized the analysis and subgrouping of tumors, including primary central nervous system tumors such as medulloblastoma [30–39], posterior fossa ependymoma  and GBM [9, 41–46]. The Tumor Cancer Genome Atlas (TCGA) has been central in defining the molecular heterogeneity of adult GBM tumors and HGGs [41, 42, 46]. Initial efforts focused on the sequencing of 600 candidate genes in 206 adult GBM tumors and identified somatic mutations in key tumor suppressor genes such as TP53, PTEN, NF1, RB and PIK3R1, as well as in the oncogenes EGFR, ERBB2 and PIK3CA  (Table 2). These and other large-scale sequencing efforts also identified recurrent, somatic, gain-of-function mutations in IDH1/2 (encoding isocitrate dehydrogenases of the citric acid cycle), which were shown to characterize the vast majority of adult secondary GBM tumors, but were rare in de novo/primary GBM tumors [47, 48]. Patients with IDH mutations were younger adults (age range from 25 to 53 years in  and from 13 to 71 years in ) and had a better overall survival . Identification of IDH mutations in lower-grade diffuse gliomas and secondary GBM tumors suggests that such a mutation might be an early initiating event in gliomagenesis that is also important in tumor progression [47–49]. Further integrated molecular analysis allowed the identification in adult GBM tumors of four expression subgroups defined by mutation/alteration in PDGRFA, EGFR, IDH1 and NF1 . Verhaak and colleagues utilized an 840-gene signature to cluster adult GBM tumors into four subgroups, each defined by a gene expression subset encompassing neurodevelopment, traditional cancer-associated pathways or markers of differentiation . Further investigation into the epigenomes of HGGs through the analysis of global DNA methylation analysis led to the identification of three epigenetic clusters, one of which demonstrated global hypermethylation and was largely defined by IDH mutations with a 'proneural' gene signature, the CpG-island hypermethylator phenotype, G-CIMP . FGF, fibroblast growth factor; GOF, gain of function; LOF, loss of function; PDGF, platelet-derived growth factor; PI3K, phosphoinositide 3-kinase. Although pediatric and adult HGGs are indistinguishable under the microscope , recent molecular characterization has demonstrated that they are in fact distinct molecular entities. Age-related differences in GBM tumors and HGGs are evident when considering molecular profiling studies based on global gene expression and copy number analysis [44, 51, 52]. In pediatric GBM tumors, which occur largely de novo, IDH1, EGFR, PTEN and other classic driver mutations and alterations identified in adult GBM tumors are rare, affecting mainly adolescents [10, 51] (Table 2), indicating that other critical elements are involved in pediatric gliomagenesis. Our group was able to characterize the differences in global gene expression between pediatric and adult GBM tumors and demonstrated that RAS/AKT activation correlates with worse overall survival in pediatric GBM . In addition, overexpression of Y-box protein 1 (YB-1) was common to most pediatric GBM tumors, demonstrating age-related differences in brain tumors, as well as within-age-group heterogeneity when considering RAS/AKT clinical correlates [44, 45]. Integrated copy number and gene expression profiling studies also suggest intrinsic biological differences in pediatric HGGs, notably with respect to the rarity of EGFR amplification or its recurrent gain-of-function variant (EGFRvIII), which occur frequently in adult GBM . However, in pediatric GBM tumors, including DIPGs, PDGFRA amplification was detected in 10 to 15% of samples, with an increased frequency of 30% in irradiation-induced tumors, suggesting an early initiating role of this mutation in pediatric HGG tumorigenesis  (Table 2). In addition, the spectrum of high-level focal amplifications and homozygous deletions is also unique in pediatric and adult age groups (Table 2). Although limited EGFR amplification is present in pediatric GBM, overexpression of this RTK, PDFR-α and MET, another RTK, have been identified in a substantial number of cases, especially in DIPG, indicating that similar signaling pathways are activated, albeit through distinct molecular triggers. However, similar to in adults, several clinical trials aiming to target these kinases in children have had limited therapeutic success , which may be partly due to poor bioavailability in the brainstem in addition to blood-brain barrier issues . Intriguingly, pediatric GBM, despite its aggressive biological nature, shows far fewer focal amplifications and homozygous deletions than its adult counterpart . The strikingly normal genome for one of the most aggressive human cancers highlights the distinct biology of pediatric GBM and HGG, and clearly indicates that alternative pathways to those associated with the traditional cancer hallmarks may be driving oncogenesis in children. Several groups, including our own, have used next-generation sequencing technologies and integrated the results with copy number, gene expression and DNA methylation datasets in separate and independent 'TCGA-like' pediatric initiatives. This has led to the identification of recurrent gain-of-function somatic mutations in H3F3A in pediatric GBM at critical residues involved in histone post-translational modifications [9, 10, 54, 55] (Table 2). We further uncovered additional mutations in the histone H3.3 chaperone genes ATRX and DAXX [10, 56], indicative of altered chromatin remodeling pathways in 44% of pediatric GBM tumors . In a large adult and pediatric glioma cohort comprising 784 tumors ranging from WHO grade I PAs to grade IV GBM, H3F3A mutations were found to be highly specific to GBM in the pediatric setting (patients aged less than 20 years) , with recent studies confirming their specificity to diffuse high-grade tumors  but also identifying the presence of the H3F3A K27M mutation in a small percentage of low-grade diffuse gliomas of the thalamus (1.9% of the tumor series) . Independently, as part of the International Cancer Genome Consortium PedBrain Tumor Project, the H3F3A K27M mutation was identified in a thalamic PA tumor (1 of 96) in conjunction with NF1 and an activating FGFR1 hotspot mutation; a constellation of mutations also seen in 3 of 48 thalamic GBM tumors upon re-analysis, suggesting a potential mechanism for gliomagenesis in this brain region . Further to this, individual H3F3A mutations were also described in distinct age groups, with K27M mutations being restricted to infant and childhood GBM (median age 10.5 years, range 5 to 23 years), and G34R/V mutations defining GBM in adolescents and young adults (median age 18 years, range 9 to 42 years) [9, 10]. Interestingly, in the context of DIPG, around 80% of samples carried the K27M mutation in either the non-canonical H3.3 (approximately 60 to 70%) or the canonical H3.1 (approximately 18%), while 80% of thalamic pediatric GBM samples carried the K27M H3.3 mutation, indicative of a midline (diencephalon/thalamus, brainstem, spinal cord) predilection for this specific amino acid substitution [10, 11, 54]. Compound mutations identified in conjunction with H3F3A mutations can give great insight into additional genetic hits required for tumorigenesis. ATRX mutations were reported in association with both K27M and G34R/V mutations in pediatric GBM, with an almost complete concordance in G34R/V-mutant tumors, which were also completely defined by mutations in TP53 . ATRX mutations were present in more than 80% of thalamic K27M H3.3 tumors but, strikingly, were found in barely 10% of brainstem K27M H3.3 tumors, where they seemed to mainly occur in older children with DIPG, further implicating this combination (H3F3A and ATRX mutations) in GBM in older children and adolescents . Recent studies have explored the association between telomerase reverse transcriptase (TERT) promoter mutations and ATRX (shown to correlate with the alternative lengthening of telomeres phenotype in pediatric GBM  and pancreatic neuroendocrine tumors ). These studies have shown that these alterations appear to be highly mutually exclusive, with 0 of 83 gliomas (across glioma subtypes including GBM, grade II to III astrocytoma, oligodendroglioma and oligoastrocytoma) with TERT promoter mutations demonstrating co-mutation with ATRX (P<0.0001) . This provides insight into the mechanism of tumorigenesis and the manner in which glioma cells exploit the cellular telomere maintenance machinery. The reports that uncovered H3.3 mutations in pediatric HGA were the first to identify mutations in a regulatory histone in humans. Except for rare cases, these mutations seem to be specific to HGA [20, 21], and have not been identified in any other cancer to date except for one sample from a child with acute lymphoblastic leukemia out of 1,004 leukemias and lymphomas sequenced . Recurrent H3F3A mutations represent the pediatric counterpart of the recurrent IDH mutations identified in young adult GBM, with which they are mutually exclusive [9, 10]. Intriguingly, IDH alterations, which are also gain-of-function, heterozygous somatic mutations, have been shown to be initiating events in gliomas [41, 47, 61] and they also seem to require association with other genetic events to achieve full-blown tumorigenesis. They are associated with two mutually exclusive genetic alterations, TP53 alterations and 1p/19q co-deletions [6, 62] that respectively characterize astrocytic and oligodendroglial IDH-mutant gliomas. We [10, 11, 63] and others [64, 65] recently showed that mutations in ATRX characterize IDH- and TP53-mutant astrocytomas in young adults with low- and high-grade tumors and that these ATRX mutations are mutually exclusive with CIC mutations, which characterize oligodendroglial tumors. Strikingly, the oncometabolite produced as an effect of neomorphic IDH mutations has been shown to affect the epigenome and post-translational modification of the specific lysines identified to be directly (K27) or indirectly (K36) affected in pediatric HGG [66–69], as well as to globally perturb DNA methylation patterns [9, 42], similar to the impact of each of the H3.3 mutations that were identified . Indeed, the incorporation of adult and pediatric GBM datasets obtained by utilizing the DNA methylation Illumina 450k platform allowed for further sub-classification of GBM across the age spectrum into six robust epigenetic clusters, three of which were defined by epigenetic driver mutations in H3F3A (K27M, G34R/V) or IDH1 , alluding to the importance of epigenomic dysregulation in pediatric and young adult HGGs specifically. We recently identified SETD2 mutations in nearly 15% of pediatric and young adult HGGs . SETD2 mediates trimethylation at lysine 36 of histone H3  and mutations in this gene correlated with a global decrease in H3K36me3 levels, thus affecting post-translational modification of the K36 mark, which is indirectly targeted by G34R/V mutations of H3F3A and IDH1 mutations [55, 69]. SETD2 mutations occurred exclusively in tumors of the cerebral cortex, paralleling the age range of IDH1-mutant gliomas (SETD2-mutant tumors median age 16 years, range 1 to 58 years) . These findings suggest that in the context of tumors arising in the cerebral cortex in children and young adults, mutations affecting H3K36 methylation appear to predominate, with H3F3A G34R/V, IDH1 and SETD2 mutations defining about half of all pediatric high-grade gliomas of the cerebral cortex , whereas mutations affecting K27 (K27M H3.3 or H3.1) predominate in midline pediatric HGGs (Table 2). These findings define a spectrum of tumor heterogeneity with definable age ranges, demonstrating that distinct genetic alterations are associated with unique epigenetic profiles. Integrated profiling and biochemical approaches to elucidating the functional impact of H3F3A, SETD2 and IDH1 mutations are necessary to determine their mechanism of action and provide targets for therapeutic intervention. Recent efforts have demonstrated global decreases in H3K27me3 levels in K27M-mutant pediatric DIPG and HGG tumors [69, 71, 72], and have shown mechanistically that H3.3 K27M overexpression can cause a global decrease in H3K27me2/me3 levels in a cell-type-independent manner [69, 72]. By utilizing in vitro assays with a biotinylated H3.3 K27M peptide, Lewis and colleagues  provided convincing evidence that global levels of H3K27 trimethylation decrease through binding and inhibition of the H3K27 trimethyltransferase EZH2 (a component of the polycomb repressor complex 2) (Figure 2). Taken together, these findings provide a basis for the striking decrease in global H3K27 trimethylation in the context of H3.3 variant K27M mutations, which comprise only a small percentage of total cellular H3. Also, GBM cell lines possessing H3.3 G34 mutations demonstrate specific transcriptional programs involved in stem cell fate and forebrain development and differences in the genomic distribution of the histone mark H3K36me3 . In addition, upregulation of MYCN provides a subgroup-specific target in future endeavors towards targeted therapeutics in H3.3 G34R/V-mutant GBM  (Figure 2). With further insights into the mechanism of action of H3.3 mutations and their role in subgroup-specific tumorigenesis, individualized translational approaches can be investigated, with the potential for achieving clinical improvements in these patients. Proposed schematic model detailing epigenetic driver mutations in H3F3A and related pathway mutations. (a) Under normal conditions, K27 and K36 act as repressive and activating marks, respectively. (b) Mutations in H3F3A at K27M lead to decreased trimethylation on K27 by EZH2, causing gene activation and leading to abnormal gene expression. (c) Mutations in H3F3A at G34R/V lead to an alteration of K36 methylation, and are associated with abnormal gene expression. (d) Mutations in SETD2 cause a decrease in trimethylation of K36 and may potentially lead to abnormal gene regulation. (e) ATRX/DAXX mutations have been shown to play a role in the alternative lengthening of telomeres. WT, wild type. Neuroanatomy is integral to assessing patient prognosis, surgical planning, and subsequent functional sequellae in brain tumor treatment. In this regard also, H3F3A mutations are significant, as K27M mutations characterize midline tumors in regions such as the thalamus/diencephalon and brainstem whereas G34R/V mutations are confined to cortical regions of the hemispheres, as we have outlined earlier [9, 10]. Studies of DIPG have shown that over 80% of these tumors are defined by recurrent mutations at K27 of H3.3 or H3.1 (K27M) . In addition, K27M H3.3 mutation was associated with decreased overall survival in DIPG patients; data that support the use of stereotactic biopsy and a more personalized approach to attacking this aggressive tumor . Complementary to this, G34R/V mutations in H3.3 and IDH1 R132-mutant tumors, preferentially occurring in cortical areas, appear to be associated with better overall survival than their K27M counterparts, and this comparison of better overall survival in G34-mutant compared with K27M-mutant tumors is also true when controlling for better accessibility to surgical resection in G34-mutant cases . This striking neuroanatomical specificity provides information with regard to the suspected cellular origins of particular GBM subgroups, as regions of the subgranular and subventricular zones are NSC-enriched locations . Recent work in mice, using cell-type-specific lentiviral induction of gliomas, demonstrated subgranular and subventricular but not cortical location preferences for NSC-mediated tumors . Contrary to this, astrocytic tumors developed in cortical regions, as well as the hippocampus, striatum and subventricular zone . A H3.3 K27M-mutant human DIPG xenograft has recently been shown to express nestin, a marker of NSCs . In addition, differential expression of the OLIG1, OLIG2 and FOXG1 transcription factors between K27M and G34R/V tumors not only provides opportunities for diagnostics, but also provides insight into the cellular origins of these epigenetic driver mutations . It is tempting to hypothesize that H3F3A mutations (K27M and G34R/V) and IDH1 mutations constitute developmental defects and arise in unique precursor cells in different brain regions, explaining their substantial heterogeneity and differing clinical behavior. Taken together, neuroanatomical findings indicating cortical and midline compartments for G34R/V and K27M tumors, respectively, and expression of stem cell and lineage markers suggest unique cellular origins and/or profound reprogramming that is characteristic of each histone mutation. Recent evidence has allowed clinicians and researchers to glimpse the unique genomic paradigm presented by pediatric HGG tumors. Incorporating these findings into the design of future clinical trials and as companion diagnostics to routine pathology will be essential in evaluating their significance in personalized approaches for patients with these deadly diseases. Large-scale projects in other pediatric central nervous system tumors such as medulloblastoma have permitted the identification of subgroup-specific targets, providing platforms for the development of targeted therapeutics in a personalized manner . Similarly, using evidence provided by recent genomic studies, independent investigations and modeling of epigenetic and gene expression subgroups of GBM tumors and HGGs in both adult and pediatric settings will allow for investigations into mechanisms of tumorigenesis in a subgroup-specific fashion. As such, future in vitro and in vivo models of GBM tumors and HGGs possessing driver mutations, notably those involving RTKs, H3F3A K27M and G34R/V, SETD2 and IDH1 will constitute invaluable tools to enable molecular profiling and eventual drug development and screening. Recent characterization of a conditional IDH1 knock-in mouse model demonstrated a comprehensive recapitulation of DNA methylation and signature histone marks seen in human acute myeloid leukemia, in which IDH1 and IDH2 R132 and R172 mutations, respectively, have been described, in addition to gliomas [68, 75]. Such models, which reproduce findings in human tumors, namely alterations in histone and DNA methylation patterns in the context of IDH1 mutation [41, 66], permit potentially reliable and accurate platforms for drug screening in pre-clinical research. Notably, recent characterization of a mutant IDH1 inhibitor and its ability to block growth and induce differentiation in IDH1-mutant glioma cells, independent of drastic global DNA methylation changes, raises additional questions about the mechanism of action and oncogenicity of identified epigenetic driver mutations such as IDH1 R132H . Accurate diagnostics and subgrouping enabled by genomic characterization of pediatric HGG tumors presents a potential avenue for further stratifying clinical management. Recent studies have demonstrated the diagnostic potential of H3F3A sequencing owing to the specificity of these mutations for diffuse, overwhelmingly high-grade tumors, albeit with a few exceptions [10, 11, 20, 21, 57, 77]. In conjunction with immunohistochemical markers of FOXG1 and OLIG2 expression, the identification of K27M- and G34R/V-mutant tumors in parallel with routine molecular pathology analyses presents a potential means of identifying patients possessing these mutations that demonstrate different clinical courses . Recently described IDH1 R132H-  and H3.3 K27M-specific  antibodies will undoubtedly be of great benefit to neuropathologists complementing histology with translational tools as these become available. In the context of unresectable DIPG tumors, which currently have a dismal prognosis, patients with H3F3A K27M mutations demonstrated worse overall survival than H3F3A wild-type tumors . As mentioned earlier, such findings indicate that stereotactic biopsy and tumor profiling may enable differential clinical management of H3F3A K27M-mutated and wild-type DIPG, which recent studies have shown are markedly distinct at the molecular level [11, 69, 72]. Additionally, in the context of pathologic biomarker development, recent advances in magnetic resonance detection offer valuable non-invasive approaches; this is exemplified in the context of 2-hydroxyglutarate detection in IDH1-mutant glioma patients by novel magnetic resonance and spectroscopic techniques [79–81]. Taken together, further genomic characterization and modeling of individual epigenetic subtypes of GBM and HGG and subsequent characterization of their clinical correlates may form the basis for stratification of future clinical trials. At present, there are no effective therapies for childhood HGG, including GBM and DIPG, and these tumors remain lethal across the age spectrum. Recent genomic studies have succeeded in elucidating novel mutations and biochemical mechanisms at play in these tumors, with further studies into subgroup-specific mechanisms forming the next critical step towards improvement in the clinical management of this deadly group of diseases. The identification of driver mutations in H3F3A, ATRX, DAXX, IDH1 and SETD2 has revamped the way we think about HGGs, and has placed chromatin remodeling defects center stage, notably in the context of pediatric and young adult disease . As discussed earlier, recent genomic and epigenomic studies have not only begun to shed light on the subgroups of GBM, but additionally on how these groups vary according to clinical variables, with pediatric and younger adult patients demonstrating driver epigenetic defects, and older patients presenting more frequently with classical defects in RTK and growth-related pathways . This speaks volumes with regard to patient management and the design of future clinical trials: specific patient recruitment and genomic profiling will increasingly be necessary to tackle the many facets of GBM and HGGs. Novel efforts to design therapeutics will undoubtedly benefit as new, exciting studies continue to emerge throughout oncology, outlining the role of epigenetics and histone marks in regulating cellular processes [66, 68], the function of dysregulated metabolism in cancer cells [67, 82] and, importantly, the interaction of genomics, epigenomics, transcriptomics and metabolomics enabled by the continuous shift towards systems-biology-based approaches. Progress towards better management of patients with these tumors will necessitate a more personalized approach and the cooperation of clinicians, pathologists, researchers and bioinformaticians alike. Identification and mechanistic elucidation of the effects and profiles of driver mutations may form the basis of target discovery, and the development of in vitro and in vivo models will enable functional characterization and drug screening. Following this, translational approaches will enable us to better stratify clinical trials and adopt these molecular tools to maximize the benefits for patients and their families faced with HGG diagnoses. Noha Gerges, Adam M Fontebasso contributed equally to this work. This work was funded in part by Genome Canada and the Canadian Institute for Health Research (CIHR), with co-funding from Genome BC, Genome Quebec, CIHR-ICR (Institute for Cancer Research) and C17, through the Genome Canada/CIHR joint ATID Competition (project title: The Canadian Paediatric Cancer Genome Consortium: Translating next generation sequencing technologies into improved therapies for high-risk childhood cancer). AMF is supported by a studentship from the CIHR and the McGill University Systems Biology Training Program. NG is the recipient of a studentship award from the Cedars Cancer Institute. NJ is the recipient of a Chercheur Clinicien Senior Award from FRQS and a 'Next Generation Champion of Genetics' award from the Canadian Gene Cure Foundation.